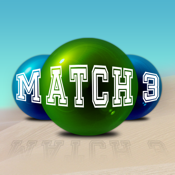 Match-3 On the Beach with Candy is the best Match 3 Game currently available on the App Store. Your mission is very simple, you just have to crush all the bubbles when 3 of them have the same color. The interface is very cool and very relaxing to introduce you in a Candy World where normally just children have the keys!